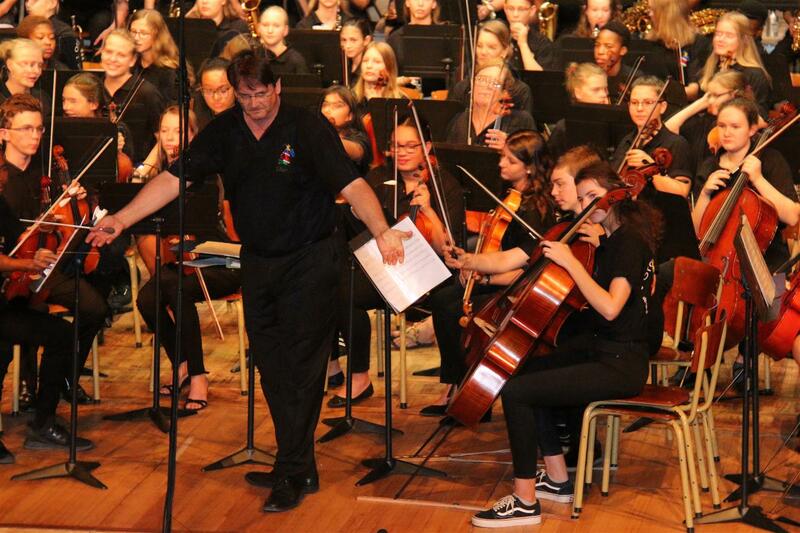 Around 100 motivated young musicians from the German schools in Windhoek, Cape Town, Johannesburg and Pretoria practised the varied concert programme from Strauss and Brahms to Michael Jackson and Walt Disney film tunes. Under the direction of the renowned South African conductor, Alexander Fokkens, the pieces were perfected and performed with a lot of wit, drive and, above all, joy in making music together. For Fokkens, working with children and teenagers is always something very special. The energy on stage inspires him and the young people equally – he joked and with his personality he managed to relax the atmosphere during the rehearsals and even in the final concert. “It is my goal that, after the final concert, all learners feel that music is something absolutely fantastic. Otherwise, I went wrong somewhere”, Fokkens said in a press interview. He definitely achieved this goal not only with the participants, but also with the enthusiastic audience. A mix of music – from classical to pop – struck the right note with the audience. The musicians’ joy in their music immediately touched the spectators, gave them goose bumps and got them off their seats with roaring applause.